From the makers of the Sea-Band anti-nausea acupressure wrist bracelet. 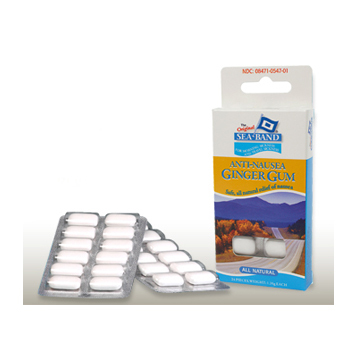 Anti-Nausea Ginger Gum is ideal for relieving travel sickness, morning sickness and chemotherapy induced nausea. No side effects! Unlike doctor-prescribed nausea medication, ginger gum does not have the side effects of drowsiness, disorientation, and dry mouth. 25mg of ginger oil per piece – that’s the equivalent of 8g fresh ginger root. Each package includes 24 pieces of ginger gum in 2 foil packs. Gum base, corn syrup, natural sugar, soya lecithin, menthol, color (titanium dioxide), glazing agent, carnauba wax, natural ginger oil. Purchase Seaband Ginger Anti-Nausea Gum from our retail website, BabyHopes.com.